Apparently the straw that broke the camel’s back was the collaboration of the Catholic social justice lobby NETWORK, founded forty years ago by 47 nuns from two dozen communities, and the Catholic Hospital Association in supporting the Obama health care plan. More progressive feminist Catholics, myself included, rued the fact that the plan did not cover the full spectrum of reproductive health care—including abortion. Nevertheless, the pragmatic nuns offered bona ﬁde Catholic support for the proposal as written, over and against the US bishops who, to this writing, continue to oppose the legislation because it includes coverage for contraception without enough exemptions to satisfy them. The fact that President Barack Obama and members of Congress took the nuns to be normatively Catholic—or at least as Catholic as the bishops—was just more than the delicate souls in Rome could stand. This latest mandate to reform the LCWR—indeed to put it out of business—has been in the works for years. In a process that began in 2008, the “doctrinal assessment,” as it is known, was aimed at investigating the “serious doctrinal problems which affect many in Consecrated Life.” In the face of wars in several parts of the world, ecological crises throughout the planet, and severe economic injustice, it is morally embarrassing that the Vatican chooses to spend its time on such trivia. But given that the result is aimed at some of the very people whose lives are dedicated to peace making, Earth enhancement, and economic sharing, it is worth clarifying what is at stake. The truth is, most Catholics no longer look to Rome for guidance on our personal lives, or anyone else’s. Nor do we live within the narrow conﬁnes of a cultic Christianity, or, as women, accept male leadership and priestly ministry as if theirs were God-given and ours were not. We appreciate the complexity of these matters and strive to create forums in which to listen, discuss, discern, and pray. In short, our ways of being are as different from the Vatican’s as are our views. The Vatican knows this, is not pleased, but can’t do much about it. It is trying to put LCWR in the untenable position of having its every conference, publication, and public utterance subject to episcopal veto. The real aim, in my reading of the situation, is to replace LCWR with the Council of Major Superiors of Women (CMSW), a group of conservative, habit-wearing, bishop-obeying nuns that Rome has been cultivating all along. That group’s blueprint for religious life is expressed in The Foundations of Religious Life: Revisiting the Vision, a volume that reads like Vatican ofﬁcials wrote it. Perhaps they did. Although what is more disturbing is that the Vatican has set women up against one another. Conservative women religious collaborated on the Apostolic Visitation and will be appointed to the Archbishop Delegate’s Advisory Team. Roman Catholic Church history is unfolding before our eyes. The difference these days is that tactics Rome employs are transparent. Just as Archbishop William E. Lori was recently rewarded for his work on contraception and “religious liberty” by being named bishop of Baltimore (and will likely become a cardinal soon) we can predict that Archbishop Delegate Peter Sartain of Seattle who is doing this work on behalf of Rome has already had his head measured for a new hat. Catholics schooled in the ways of justice—largely by the nuns—recoil at the power play this mandate represents. Three things are especially repugnant. First, there is no real discussion. The Prefect of the Congregation for the Doctrine of the Faith Cardinal William Levada asserts that “the ﬁrst step in the implementation of the ﬁndings” is a personal meeting “in a spirit of mutual respect and collaboration.” This is rather fanciful since the LCWR leaders who received the document were not at all sure it was coming. They went to Rome with the intention of engaging in dialogue, not being presented with a fait accompli. Second, this move seems like an effort to cut off the head of lay people in the Church, beginning with the nuns. The Vatican acknowledges, “the inﬂuence the LCWR exercises on religious Congregations in other parts of the world.” Add to that its political inﬂuence in the US and the hydra that is LCWR was ripe for beheading. I insist on the larger lay component of this chapter in church history because groups like Women-Church Convergence and Catholic Organizations for Renewal represent far more progressive theo-politics than LCWR. Because those groups and others like them are canonically independent of the Vatican they simply can’t be touched, but they are no less Catholic. LCWR was punished for associating with such groups, including Women’s Ordination Conference, New Ways Ministry, and others of “radical feminism” of my intimate acquaintance. Efforts to squelch LCWR are simultaneously efforts to discredit those groups. And finally, there’s the current “war on women,” with Catholic bishops leading the charge. In the U.S., it is manifest in the skirmishes around reproductive rights. Young and poor women suffer greatly, but all women are implicated in these policy conflicts. Around the world, we find the Vatican successfully making alliances with other religious fundamentalists to prevent UN-based consensus on women’s reproductive health care. Casualties are many among poor and young women, the very ones the nuns would protect. So it is no surprise that the same bellicose ways operate within the kyriarchal church itself. The question is how to stop the cycle of violence, how to refuse to cooperate in structures that oppress, how to “engage impasse” as some of the most creative nuns have tried to do. 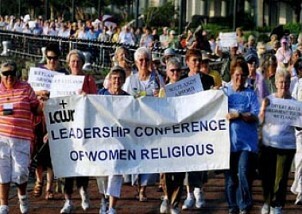 LCWR will ﬁnd its way with a great deal of support and solidarity from the rest of us lay Catholics and those clergymen who are able to distance themselves from the hierarchy. Likewise if the Apostolic Visitation results are similar to the LCWR debacle, I predict that the individual communities will also ﬁgure out strategies for moving forward. I am less sure that the Vatican will recover. WATERwheel Vol.21, No.3 May 2012 Prayer: Blessings on Mother’s Day!